In this article we make the point that Anaerobic Digestion UK Professionals need to shout louder about their vision of a global biogas boom. This video is inspired by an editorial by Charlotte Morton, ADBA’s Chief Executive, and she is quite right to point out that while the benefits of anaerobic digestion are well understood to those that work in the industry. The vision of what might be achieved, which many hold, simply is not getting out into the public domain as forcefully as it merits. Anaerobic Digestion Plants in the UK (Anaerobic Digestion UK) are already delivering exceptional value, but so far have delivered only a fraction of the potential of this technology. With further investment the UK Biogas industry can not only keep growing, .meeting the UK’s energy security, food security and greenhouse gas goals. But, the technology of biogas can also help the world deliver sustainable development. 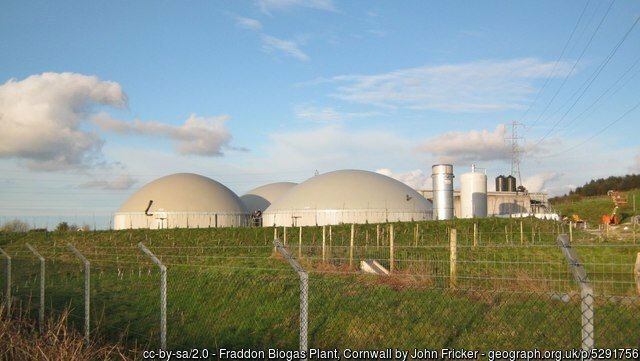 Fraddon Biogas Plant, Cornwall The Fraddon Biogas Plant converts organic materials from local agricultural and food waste into gas and electricity by anaerobic digestion. It produces 1000 cubic metres of gas per hour and is one of only a few AD plants in the UK to feed bio-methane into the gas grid. Global agreements like COP21 are only a start in terms of recognising the challenges we face. Climate change is already hindering efforts to reduce poverty and hunger in the developing world. In the not too far distant future climate change could increase the number of malnourished children by 25m. In Bangladesh alone, it could displace, an extra 6-8million people by flooding. As much as 40 per cent of the world’s population does not have access to clean cooking fuels. This is leading to the premature deaths of 4million people each year, and 15 per cent do not have access to electricity. There should be no limit on the aspiration of the citizens of the UK, and the whole world, to meet these challenges. AD could generate energy more cheaply than coal, and become one of the leading technologies for mitigatin, climate change, improving sanitation, ensuring energy and food security, and reducing poverty and hunger. The Anaerobic Digestion UK industry could be a global leader in what could become a £1 trillion biogas industry exporting expertise and equipment worth billions of pounds and creating tens of thousands of jobs. All those that know this need to shout louder and clearer about this potential for the UK in a global biogas boom. We need to shout louder and clearer about this potential for the UK in a global biogas boom. The combination of Energy and Industrial Strategy in one department was not universally popular among groups representing the green economy. But for an industry like ours it represents an opportunity to show government what we can contribute, not only as a form of green. Why we must shout louder about the global benefits of AD By Charlotte Morton, ADBA’s Chief Executive gas and baseload power, but also as an important technology for the UK’s manufacturing sector and balance of payments. All of this helps us make the argument for domestic support, too. It raises our profile, when other forms of renewable energy tend to dominate public and political consciences, and it shows that the government’s investment will produce an exceptional return. It directs us to new opportunities, which are opening all the time as technology and markets develop. But as we look at the opportunities ahead, we also see barriers. Separate food waste collections – which Defra’s Chief Scientific Adviser told me were the best investment of £55m he could think of – are the norm in Scotland, Wales and Northern Ireland, but not yet in England. The Renewable Heat Incentive budget is in place, but won’t deliver anything until the tariffs and rules are confirmed. The Feed-in Tariff has been squeezed almost out of existence, and with the Renewables Obligation closing in March the government is leaving a black hole where policy for renewable electricity used to be. Within the industry, we also have to keep challenging ourselves to do things better. Improving performance and compliance is vital for our reputation and reduces risks around insurance and regulation. Improving the AD process – for example, by looking at ways to match the digestion efficiency in nature – is just one focus for our world-leading academic researchers. Together with a more supportive policy environment, this could start to deliver our potential around the world. Sir. We seek help for our project. This organization aims to improve the living conditions of the population through the implementation of technology in biodigesters. This project consists of the installation of the completed systems and integrates the treatment of organic residue coming from small pig farms and the transformation of the excrement into biogas, as well as fertilizer for crops. All professionals do need to work harder to communicate benefits of biogas technology. The growth of social media means we have to get much more involved, or be out-shouted. Well done ADBA and others. But, more needs to be done.